After major renovation work, the Arc de Triomphe Étoile*** hotel now boasts a modern and unique décor inspired by the concept of an 'urban fault-line'. Patrick Mourot's dream was made a reality by Lyonnais interior designer Peggy Leroy, founder of the Del In agency. The designer décor is fiercely contemporary and urban in spirit. The hotel is non-smoking and offers a wide range of facilities including a lift, a larger family room, and the option of having a buffet breakfast in the dining room or breakfast served to you in your room (at no extra cost). 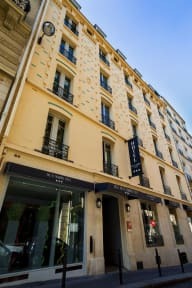 The Arc de Triomphe Étoile*** hotel is an attractive little hotel situated in a quiet street just a short walk from the famous Place de l’Étoile, the Champ-Élysées and the Place des Ternes. It is an ideal location, popular with both business travellers and tourists alike. 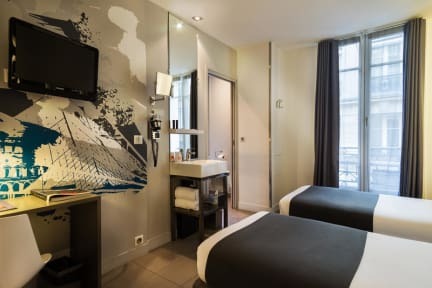 Excellent public transport links are close by, allowing easy access to the Palais des Congrès, the La Défense quarter, the Louvre museum or even Saint-Germain des Prés, all less than fifteen minutes away. This attractive hotel has 27 unique, modern rooms. You will love the distinctive graffiti-based style of graphic designer Wozdat, an artist of the Street Art movement, who took inspiration from Parisian monuments in creating these quirky and unusual room schemes. The rooms are sound-proof and non-smoking for your comfort. Two of them are fitted out to welcome guests with reduced mobility. The hotel is fully air-conditioned and offers the high levels of comfort and quality our guests have come to expect. Breakfast not included. Extra-cost: 13 euros per person per day. Breakfast is served from 7 am to 10 am.